This is our second report on a dust storm in Haberfield in April this year. This story focusses not just on the air quality issues but also on how Sydney Motorway Corporation (SMC) and its contractors respond to complaints. 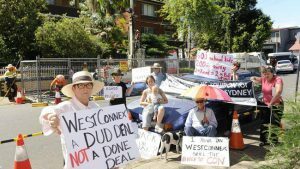 This issue is relevant to the governance of WestConnex, which is one of the matters being inquired into by the NSW Parliamentary Inquiry into the impacts of WestConnex. NSW Planning grants approval for WestConnex projects on condition that SMC put in place community feedback and complaints schemes. But when residents try to use these mechanisms to raise concerns, they often find themselves blocked. It is frustratingly difficult to hold the SMC and its contractors accountable for their actions. The duststorm provides a case study of how this can happen. Parents and other residents who have well-founded health concerns deserve to have their complaints properly investigated, not treated with contempt. But as the evidence below shows, WestConnex contracting staff gave residents implausible and misleading responses to their complaints. This not only shows a reckless disregard for health but also treats the complaint process with contempt. On the afternoon of April 9, Haberfield resident Sharon Laura was in Bland Street, just opposite the local public school. Bland street runs towards Parramatta Road where WestConnex is constructing the exit to the M4 East tunnel, which is scheduled to open early next year. Looking towards Parramatta Road, Laura could see dust swirling everywhere. She turned on her phone camera and was able to video for 48 seconds. ( May 2018 is publication of video date, not the date of filming). Not long afterwards, Haberfield parent Sherrill Nixon was collecting her children from school. She later told Skid Row's Colin Hesse that the wind had sprung up in the area, picking up the dust from construction sites and turning the school into a 'dust bowl. She remembered other parents complaining that it was so dusty that they needed 'dust masks and googles. It was that bad." Under its approved Air Quality Construction Management Plan, CPB contractors are required to control emissions at their sites. If windy weather is predicted or arrives, water is supposed to be available to wet dry and dusty surfaces. If an event occurs that impacts on residents, school or community centre, the company is supposed to report the incident to NSW Planning. These records are not public. I wish to complain about the massive dust blowing off from the Parramatta Rd civil site, across the Bland St and Parramatta Rd, Haberfield/Ashfield intersection. I stepped out of my house just before 3 pm today, to be engulfed by dust blowing up from the intersection. I looked down to the intersection and could barely see the road. I saw parents and kids struggling up the hill towards the school all, coughing and complaining. ... I could taste and feel the dust. She attached the footage from her phone. She described how she had stood on the pedestrian bridge across Parramatta Road but had observed no water cart in use or any water anywhere. ( WestConnex are supposed to use water to control dust especially in windy conditions.) She described several spots in different directions from which dust was billowing. At this stage, she could no longer take video on her phone. She described how she walked back up the street where she met parents leaving the school grounds with their kids. Many were complaining and said they had seen dust rolling across the school playground. She informed them that she was aware that the Ecotech monitor on the school grounds had shown 400 u/gm3 during the episode. What on earth is happening on the site, that no preventative measures are in place to stop dust from rolling off the site, across the road, engulfing homes and people, obscuring the intersection, and blowing up the hill onto school grounds? I look forward to your response. 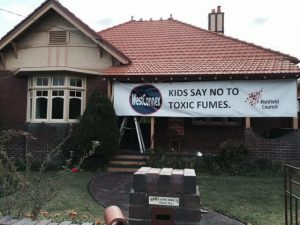 Laura, who has been living with the threat and then the reality of being surrounded by WestConnex construction sites since 2013, is well versed in the health impacts of particulate matter. Even if she hadn't been, she only needed to look as far as the NSW Health website to find that just hours of short term exposure to very high levels of PM 10 can lead to irritated eyes, nose and throat, worsened asthma and lung diseases including chronic obstructive pulmonary disease or COPD, which is often experienced by older people. It can cause those with heart conditions to deteriorate and lead to hospital admissions or even death. She also knew residents' in her neighbourhood whose children had been diagnosed with asthma for the first time after construction began. CPB Contractors community relations manager Sally Brough replied to Laura the next day. Brough, who describes herself on LinkedIn as a 'Corporate Social Responsibility professional', acknowledged Laura's complaint and thanked her. She then made four points. The safety of workers and the community is our number one priority for the project. As contractors engaged to build the M4 East project we continue to meet all regulatory requirements in the management of air quality levels. Construction dust levels across all project sites are regularly monitored as mandated by SafeWork Australia, to ensure the safety of workers and the local community. As we have mentioned in prior correspondence mitigation measures are in place to suppress dust on site and reduce airborne particles including the use of water, covering the site with hard stand, and the use of spray sealing. This is in accordance with the approved Construction Air Quality Management Plan, which is available on the WestConnex website. The Parramatta Road site stretches across more than a hundred metres. Sherril Nixon later told Skid Row Radio that the idea that 'leaf blowers' could create the volume of dust observed as 'farcical'. The response letter then continued with a broader explanation. Dust monitoring on site has not exceeded target levels. The final statement was another attempt to distract from the complaint itself. Other parents who complained received similar answers. When interviewed on Skid Row radio, Sherril described the leaf blower explanation as 'farcical'. and the responses as 'disappointing'. Laura did not accept this explanation and pursued her complaint . A second the answer came back on 12th April. Thank you for your follow up email. The project has investigated the concerns and maintains the response provided on Tuesday. Peaks were also recorded by other air quality monitoring stations throughout Sydney as the natural event occurred. Please be assured the project shall continue to manage dust onsite in accordance with relevant plans and approvals. If you have any further questions or concerns please let me know. No information is given about the 'investigation' or the 'peaks'. Without further evidence, this sort of response leaves the residents feeling powerless. There have been other duststorm and very dusty days. Residents in Haberfield and St Peters, where the New M5 is underway, provided photos, videos as well as eyewitness accounts but these are not enough to prove a case in the face of denials. The situation changed slightly when CPB contractors turned 6 air quality monitors on in mid-December. It's important to understand that the monitoring is under the control of CPB Contractors. The Ecotech website changes every ten minutes. Fortunately, on this occasion the 400 PM, 10 reading was captured and given to the media to support residents' claims that the dust was levels were very high. But ten minutes after it was captured, that 400 figure disappeared. With a few very minor changes to their website, Ecotech could easily provide tables of hourly, 24 hour and monthly averages and downloadable datasheets. But SMC who pays them chooses to keep that information secret. Monthly averages and line graphs are published in PDF reports that are not linked to the website. 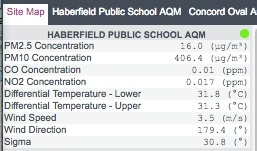 Unless journalists, community activists or Councils collect and track the data, there is little that residents can do to contest the contractor's claims that there was nothing unusual about the Haberfield PM 10 levels that afternoon. We were able to calculate the hourly averages from the records of PM 10 data collected every 10 minutes. The chart below shows the results of our analysis. The dust event lasted for about two hours. While there were elevated levels across the 6 Ecotech monitors, the levels at Haberfield School and Ramsay Street (about 300 metres away and near a different construction site) were significantly higher than at other monitoring sites along the M4 East route. There was a similar spike in the PM 10 readings on all 6 air quality monitoring stations across the project alignment and, indeed, at unrelated stations many kilometres from our construction site. The Office of Environment and Heritage (OEH) has 18 monitoring stations in the Sydney Basin. Only 15 recorded PM 10 levels in the hours from 3 -5 pm on April 9. We used the OEH search engine to compare the hourly averages of the Ecotech monitors with the OEH monitors. From 3 -4 pm, the Haberfield School monitor averaged 205 PM 10 u/gm3 and the monitor at Ramsay Street, Haberfield averaged 192 PM 10 u/gm3. During this hour, across all OEH monitors, the highest levels were at Chullora which recorded an average of 89 and the next highest was 50 kilometres away at Campbelltown West where the average was 45.6. From 4 -5 pm, when Haberfield School was 126 and Ramsay Street was 100. During this hour both Liverpool and Parramatta North also recorded high averages during this hour, jumping to 100 and 128 respectively. Other monitors were all lower. There were high winds and elevated levels of PM 10 across parts of Sydney at different times that day. But nowhere at any time on April 9 in the Sydney basin were the average hourly levels as high as they were over two hours in Haberfield. It is precisely because high wind events can occur near construction sites that companies are required to mitigate dust. Regional air quality is important but it is the interaction of regional and more local factors that will determine air quality. It is clear that CPB contractors exaggerated the similarities across air monitoring sites across Sydney and provided an implausible local explanation to push back on the residents' complaints. To be fair to Brough, she was probably repeating what she had been told by other staff who claimed to have investigated. Assuming this is true, who were these staff and what did they tell her? There is presumably a paper trail that should be investigated by NSW Planning and the NSW EPA. This significance of this event is not simply the dust storm itself, which was certainly intense enough to trigger short-term respiratory effects. It also throws light on how Sydney Motorway Corporation deals with residents, some of whom confront construction impacts on a daily basis for years. A repeated refusal to engage with evidence leads to disillusionment and exhaustion. If the number of complaints declines, SMC uses the drop in complaints to show its record has improved. Laura sent her complaint to NSW EPA, NSW Planning, her local MP Jo Haylen and the Inner West Council. The EPA have powers to impose penalties if contractors breach their licences. Currently, the EPA is prosecuting CPB contractors for breach of its EPA license during the period in 2017 when gases escaping from the site repeatedly smothered communities near the St Peters Interchange in nauseating odors. The NSW EPA still has a file open on the April 9 duststorm. Laura and Nixon have both provided statements. We are told the EPA needs more statements from residents. Outrageously, the EPA does not have routine access to Ecotech data, although presumably investigators can ask for it. Parents and other residents who are concerned about the health of their children deserve to have their complaints properly investigated, not treated with contempt. Why did NSW Planning decide that the construction impacts on air quality would be 'insignificant' despite being advised by local Council's independent experts that more evaluation was needed? Why is SMC allowed to control the monitoring of its own project? Why isn't the EPA in control of the air quality data or even represented on the SMC's Air quality committee? Why does the NSW Gladys Berejiklian government and the Minister for Planning Anthony Roberts allow the SMC to operate a complaints system that responds to serious complaints in ways that are self-serving and misleading? Will the situation get even worse when the SMC is privatised in a couple of weeks? Note: There has been a correction in the information about the hourly OEH data from the first publication of this story. An investigation into Westconnex, a 33 kilometre motorway that the NSW LNP government wants to build in Sydney. Why wouldn't NSW Labor even cost what it would take to cancel Stage 3 of WestCONnex? Does part of the answer lie in Transurban donations? WestConnex Strathfield monitor was the only Sydney monitor to breach both PM 10 and PM 2.5 national limits in 2018.